See the Events page for the 2018-19 programme of events. Please see www.southwestastrofair.com for details of the four speakers at his year's Astro Fair (including our Events Coordinator, Jo Richardson). If you haven't already purchased tickets online, they will be available on the door. The event runs from 9:30am - 5:30pm. Tiverton and Mid Devon Astronomy Society is now on Facebook. Because Facebook is easy to access on the move (for those owning a smartphone) we plan to use our Facebook page to keep people updated on events and observing sessions, the details of which can change at short notice. In addition, we will use it to post and discuss any news or events of an astronomical nature, and encourage you to join in! Tiverton & Mid Devon AS is an enthusiastic and friendly group who meet regularly for talks, social events and night sky observing sessions. Our aim is to encourage people of all ages and abilities and from all walks of life to learn about the wonders of our Universe. Please come along and try one of our meetings without obligation. Previous knowledge of astronomy is not necessary. We are a member of the Federation of Astronomical Societies (FAS). One year's membership costs £14, or £10 for senior citizens or if unwaged. Those under the age of 18 and in full-time education go free. Everyone is welcome to come along to our meetings - non-members will be charged £2 at the door (deductible on taking membership). Please note fees are due in September. Two of our members, Keston and Pete, began producing our bi-monthly newsletter, STARDIS, in the autumn of 2014. You can find all available issues here in PDF. 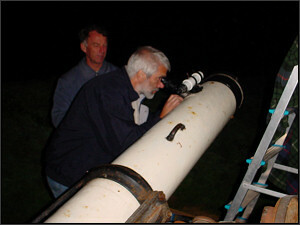 Tiverton Astronomy Society began in 1985, when Graham West convened a gathering of people in the town interested in the subject. Regular meetings began, often with visiting speakers who have covered a wide range of topics from Planetary Geology to Astrology, and from The Soviet Space Programme to Observing the Moon. Visits to other societies and observatories have also been arranged. Run informally for many years, the society has grown particularly strongly since the turn of the century. Early in 2000 it became formally constituted. At the time of the society's inauguration Douglas Rice, a teacher at Blundell's School, had recently discovered a fine 8" Newtonian telescope belonging to the school. With the help of a pupil, Nicholas Wood, and advice from Patrick Moore, he restored the instrument to working order. It was built about 1910, is extremely solid with a tube 7 ft long, and is very user-friendly (if you don't mind climbing a step-ladder). The telescope has been at Blundell's since at least the Second World War. For some years it was situated on the Blundell's clock tower, where it tended to be used by the boys for spying activities! With the school's support the instrument was re-housed in a wheel-off shed near Milestones (now Blundell's Prep School) on Blundell's road (see map). For 15 years it has been the focus for public observing sessions as well as seeing use by pupils and local groups. These days several members also bring their own modern instruments to these sessions. Co-founder of the Society at the time of Halley’s Comet in 1986, Douglas was Chairman for 28 years and still finds astronomy fascinating! 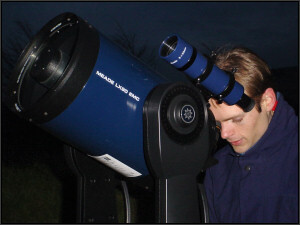 I joined Tiverton and Mid Devon Astronomy Society as a complete novice in 1996. Since then I have been on a ‘vertical learning curve’ and have developed a passion not only for astronomy but for sharing it with others, too. I have been on the society’s committee since its inception in 1999. I was Secretary for 10 years, Treasurer last year and recently returned to my long standing role of Programme Co-ordinator; this time with some great contributions from other members. I have organised and supported many society events over the years and secured us a Lottery Grant to buy some lovely telescopes. It was an honour to take on the role of Chairwoman in 2014 when Douglas stepped down. I have been involved with the society since Douglas Rice and I began to work to refurbish the Blundell's School telescope many years ago. At that time I was teaching physics at the school after a few years in universities doing research on the Sun and other things astronomical. Retirement in 2006 gave me more time to attend society meetings and to look after the finances. I have held an interest in space since childhood, however it wasn’t until I met my husband Pete in 2005 that this developed into more than just a hobby! Between us in 2010, we built a small observatory at our home in North Somerset, from which Pete has become quite well known for his astrophotography! In addition to Tiverton and Mid-Devon Astronomy Society I am also heavily involved in several other South West Astronomy Groups, namely Wells and Mendip and the Charterhouse Observatory Steering Group. I co-ordinate all their public events and work not only with them but also alongside agencies such as the National Trust and Exmoor National Park bringing astronomy and space education to the masses. I also own and run a small business called “Space Detectives” which delivers space workshops in schools, community groups and public events. My main focus is very much on Space Outreach Education and I have always held the belief that if I manage to inspire people to just “look up” and see the wonder of what is above them, then my work is wholly worthwhile! The excitement and adventure of mankind's exploration of the cosmos, and particularly of the planets, has fascinated me from a young age. My father, a pilot in the RAF and in civil aviation, encouraged my interest in space and aeronautics by providing many books on these subjects. Attending Blundell's from the age of 13, I joined both Douglas's Astronomy activity and the Astronomy Society (which met in the school's Ondaatje Hall at the time). I chose to read Astronomy and Geology at university (my dissertation was based on the volcanic Tharsis region of Mars), during which years I was absent from the club. Upon returning to Tiverton in the late '90s I rejoined the society and, like Angela, became a member of the committee when it formed. I have been interested in astronomy since I was 8 years old, living in Hackney, London. The toilets were outside, in the back yard. One night I happened to look up into the night sky and saw hundreds of bright lights, some brighter than others; I was over whelmed, rushed back indoors and asked my dad what they were – he told me they were stars. I tried to find out more on stars by asking my teacher, who thought I was young to ask about astronomy, but suggested going to a library. I was told by the librarian to come back when I was older; although I did look at some astronomy books, I could not understand them and there weren't many photographs. It was not until 1981 after leaving the Army that my love for astronomy came back, when I saw the Sky at Night TV show. I joined a local society and was instrumental in helping the society build their 20-inch telescope. I built several other telescopes after that; today I have 12-inch reflector mounted on NEQ6 computer mount on a pillar housed in a self-made observatory, which I use for visual observing and astrophotography (deep sky). I also have a Celestron XLT 9.25 Cassegrain telescope F10 which goes on EQ5 driven mount; this I use for viewing and imaging the planets. The best way to contact us if you have any queries is via e-mail: nick@tivas.org.uk. You can also call a member of the committee if you wish; our telephone numbers are listed below. For directions, please find us on Google Maps: visit maps.google.co.uk and type in the school's postcode, EX16 4NA. The school is on the south side of Blundell's Road. The school's full address is: Blundell's Preparatory School, Blundells Road, Tiverton, Devon, EX16 4NA. Apple Safari, Opera or Microsoft Internet Explorer 9+. Some sections of the site incorporate Flash animations.